Art Licensing Editorial: Retail is King! Licensing Art – Can You Make a Living Doing it? Manufacturers can not always visualize how art will look on their products so creating digital product mock-ups and placing your art on them is a good way to market your art. You can create your own mock-up templates or purchase them. Read the articles in "Art Collections / Mockups" section of my blog to see examples of mock-ups and Photoshop/Illustrator tips on creating your own templates. There is no right or wrong way to represent product shapes. They can be simple sketches of the products or very realistic and three dimensional. Any kind will do the job in showing the manufacturer how the art will look on products and it is up to each artist to choose the style they like. For instance, if your art is characters or a whimsical style, you may wish to use sketched product shapes to compliment your art. Or, if you paint fine art you may choose realistic looking product shapes. The only thing I caution you to do is to make sure that you label your marketing material that the art is available for licensing when showing realistic product mock-ups of your art. You do not want the manufacturer to think that your art is already licensed to a competitor. If you do not want to create your own templates, there are three different template packages that you can purchase to create product mock-ups; Tara Reed's "Product Mock-Up Magic," All Art Licensing's "PCLS Collection and Presentations Package with 107 Product Templates!," and Phyllis Dobb's "Create Product Mockups." Below is a chart comparing the different packages. It is tempting to slap any piece of art on any product template, send it off to manufacturers, and expect licensing deals to pour in. However, not every work of art is suitable for every product so you need to choose only the ones that work for each theme. For instance, flower art works for most products but a party theme is unlikely to work for bath products or bedroom linens. There just is not enough of a market for brightly colored balloons on sheets or shower curtains. 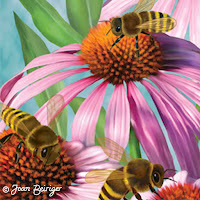 :) Read art licensing agent Jim Marcotte's article "Product Design" for a discussion about this. Also, it is imperative to create interesting product mock-ups with your art in order to get licensing deals. Do not put exactly the same piece of art on every mock-up shape in the collection! As an art director commented in one of my articles, "A true cohesive collection consists of compelling coordinating designs, interesting crops, textures, mix and match print /pattern. The same motif across all SKU's (i.e. product shapes in the collection) is dull and not very exciting." To see examples of product mock-ups, read "The Dynamic Duo #1 - Examples of Art Collections & Mockups" and "The Dynamic Duo #2 - Examples of Art Collections & Mockups." 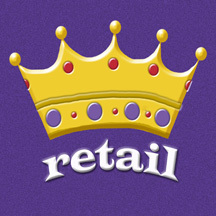 If you have been licensing your art for a while, most likely you have heard the phrase "Retail is King." In otherwords, retail stores rule what products make it into stores, if they are placed in strategic locations OR not, and how long they stay on the shelves before they are moved to the discount table. Product is expected to moved fast and a three month period on store shelves (especially chain stores) is now considered a long time. Seasonal products of course stay in stores the shortest time. Retailers no longer wait until the day after Christmas to reduce prices. This year, I saw Christmas décor prices in some stores reduced 30-60% weeks before Christmas. To illustrate the power of retailers and how fast products can be put on the "chopping block," one agent during a panel discussion at a Licensing International Show seminar described a manufacturers horror story. A product was scheduled to be introduced to the public on a Monday but as often happens it made it onto the store shelves the previous Friday. On Saturday, two days before the scheduled date, the product was deemed "dead" by the retail chain and move to the discount table. The agent did not say why the retailer decided to immediately sell the product at a discount but you can imagine how that impacted the future of the product. Not only would there be no reorders from that retailer but the word mostly likely spread to other retailers that so-and-so could not sell the product. The product was indeed dead! And if the product had licensed art on it, think what that would do to the reputation of the artist. Knowing your customer is important in any business. Of course, the ultimate customer is the consumer and retail is the major way* that customers purchase products. How products get into retail and the pitfalls the occur along the path from art to consumer is important knowledge for artists licensing their work. Read art agent Jim Marcotte article "Tap dancing for retail" to learn more about retail, the terms used, and what could happen if a manufacturer does not get the product to the retailer in time. * In 2010 retail stores is still the major way that consumers purchase products but e-commerce is a strong competitor. It may evidentially take over the number one spot in consumer buying. Retailers make it their business to stock products that consumers want because the success of their company depends upon it. So a good source in finding out what is popular with consumers is to find sources of information that is aimed at retailers and query manufacturers who have direct links to retailers. Below are some suggestions on how to do it. • Purchase trend reports & studies about consumer spending habits such as from EPM Communications, Inc. Unfortunate the reports are very pricey and out of reach for most artists. However, the site does have some interesting information worth looking at. • Searching for articles on the internet about retail trends can be time consuming but one source that has many articles related to retail is the National Retail Federation (NRF) organization. 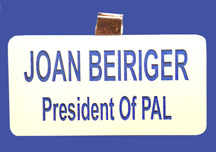 Joining the organization is pricey but the site does have some articles for the public to view. 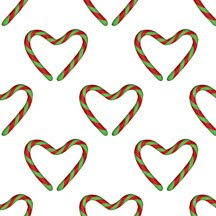 NRF also has a blog with lots of articles such as "Top ten holiday trends for 2010." • Querying your manufacturer partners is a good source in finding out what art themes are popular. When showing your art to art/licensing directors at trade shows, make sure that you ask about their take on current and future trends. • Participate in call for submissions (also called art call-out or "cattle-calls") to discover what art themes the manufacturers are looking for. If they are looking for a particular theme, you can be sure that it is what retailers are looking for and thus popular with consumers. For more about cattle-calls, read "Thoughts on Doing CattleCalls - Should You?" The above list sounds like it would be a lot of work to implement and IT IS. But to be competitive in the art licensing industry and create art that sells at retail, you must be willing to spend the time in finding out what art themes and products consumers purchase. I welcome any comments or information that you are willing to share. Please write them in the comment section below. As you know, it is important to sign your artwork with a copyright symbol in order to protect it. But the signature is often lost when art is manipulate in Photoshop while creating patterns and derivatives of the art. Of course, a copyright symbol and artist name can be typed and placed on the art but I think it is better to use your own unique signature. One method to do that is to write your signature in a Photoshop file and create a brush of it. A signature brush can be easily reused, re-sized, the color changed, and can be placed anywhere on the image. Below are instructions on how to create your own signature brush in Photoshop. Image at the right shows the location of some of the commands used in the following instructions. 1. Open a new PS file that is 2500 by about 800 pixels at 300dpi. 2500 by 2500 pixels is the maximum size allowed for a brush. Note: Any size can be used but I chose the largest allowable size so that the signature will be sharp for large paintings. 2. The background layer should be white so that the signature in the above layer really stands out. 3. Create a new layer but do not fill it in with a color. The layer needs to be transparent except for the written signature. 4. Write your signature in black with the Brush Tool. Any brush and thickness size can be used. I used the hard round brush at 25 pixels. Note: It is easier to write your signature with a Wacom pen tablet than with the mouse. Although, I used a mouse for my signature but had to edit it to make it look better. 5. If the signature is too small, enlarge it by selecting it with the Marquee Tool and dragging the window handles after pressing the command key plus the letter T.
7. Go to Edit / Define Brush Preset. In the brush name window that opened, name the brush (example: signature brush) and click OK. Note: For information on creating the copyright symbol © and adding it to your signature for your brush, go to the comment section of this article and checkout my reply to Marci's question. 1. Open a new document to test your new signature brush. Any file size will do. 2. 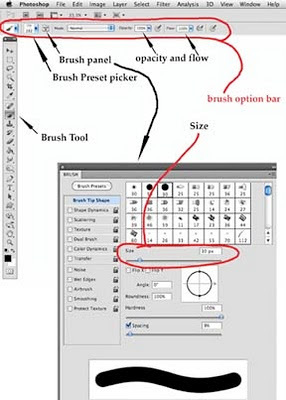 Select the brush tool (located in side panel) and click on the newly created signature brush in the pop-up Brush Preset picker located in the brush option bar (at the top of the page). 3. Choose the color you wish for the signature brush. Make sure that opacity and flow in the brush option bar is 100% or the color saturation in the signature brush will be reduced. In other words, if the flow is set at 50%, the signature would be gray instead of black. 4. Open a new layer and click once to place the signature on the page. By placing it on a separate layer, the signature can easily be edited. • If the signature is too large, reduce it with the left bracket "[" key. The right bracket "]" key enlarges the brush size. • The signature size can also be changed in the Brush panel by using the size slider. The brush panel can be opened or closed with the toggle icon in the brush optionbar or by opening it with Window / Brush option (F5). • The signature can be rotated by using the Free Transform command (command key plus the letter T) or can be warped by using the transform warp command (Edit / Transform / Warp). Warping the signature would be handy when placing it along the edge of a round piece of art or a circular product mock-up. • The color of the signature can be altered by using the hue/saturation adjustment command (command key plus the letter U) or the curves command (command key plus the letter M). 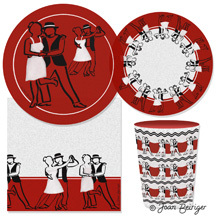 Many color and design trends in art licensing seem to be influenced by the fashion industry and then trickle down to crafts, scrapbooking, home decor and finally to the various gift industries. Thus, some of the colors and design elements seen in fashion and clothing design become prevalent years later in licensed art such as exotic animal fur designs, textured backgrounds, stylized floral & leaves, and more recently a grungy-collage art style. Therefore, by following the fashion industry is a good way to determine what design elements and style "may" eventually become popular for product art. Other trends, originate with events and social concerns existing in the U.S. and around the world such as the Olympic games, museum exhibitions, major movies, the economy, etc. Artists that are attuned to these events, create the right art, have existing connections with manufacturers and convince them to produce trend forward products will be at the forefront of these future trends. 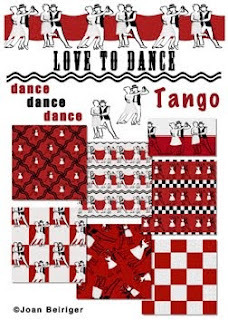 For instance, the first artists that created red and purple motifs were able to easily license them when the short lived Red Hat Society mania hit in the mid 2000s. And artists that had teddy bear art before the 100th anniversary of the teddy bear in 2002 received lots of licensing deals. More recently some artists saw art licensing opportunities with the consumer interest in Green America and created art for recycled and ecology related products. But of course, some artists just so happened to have the right art when a trend emerged such as patriotic art stemming from the aftermath of 911. Pantone is one of the major color trend setters for various industries (fashion, home decor, etc.). And these industries follow Pantone and other color predictions each year. For instance, the Atlanta gift show last January had an abundance of turquoise colored products displayed after Pantone announced that turquoise was the 2010 Color of the Year. The 2009 color of the year was mimosa (bright ochre). Pantone stated in myPantone tweet site that "Each PANTONE COLOR OF THE YEAR reflects the Zeitgeist (defining spirit or mood of a particular period of history) & provides an emotionally relevant color inspiration for the year." They have not announced the 2011 Color of the Year yet but I assume that there will soon be a proliferation of products with the color once it is made known. Not all trend predictions become true. 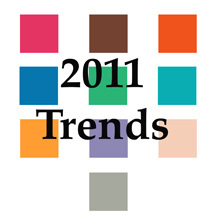 But below are links to a few articles on the expected trends for color, art and home décor in 2011. • "For Spring 2011, the Fashion Color Palette Takes an Inspired Journey of Exotic Hues"
• "2011 Color Forecast by Sherwin-Williams Paint Company"
• "Interior design trends for 2011 will reflect on ancestry"
• "Home Design Trends For 2011 Stress Green, Art And Timelessness"
In my opinion, it is not imperative for you to predict trends in order to be successful in licensing your art. Trying to predict trends can be iffy. You can be ahead of a trend or misread it while the art created for it languishes in your studio. It is more important to be true to your art style, learn what your customers (manufacturers, retail stores, and consumers) are looking for, continually create new art, and make your art fresh and new looking. However, I must admit that I do follow trends to a certain degree and use ones in my new collections that makes sense for my art style. 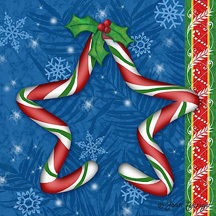 Read art licensing agent, Suzanne Cruise article "How to Keep Art Fresh & New: Reworking Old Art for Today's Greeting Card Market" for information and examples on evolving art and links to other articles on this subject. Make sure that you read the comments to this article. 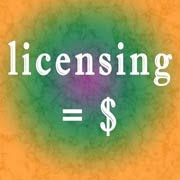 Licensing experts have "chimed in" and have posted important information. Thanks to all who took the time to post their questions and the experts who shared their knowledge! ! ! I welcome any comments. Please write them in the below comment section. Adobe Photoshop and Illustrator CS5 have added some major VERY useful commands and tools to the software. For instance, Photoshop has new commands that will do a much better job of extracting images (including hair and fur) from art than the methods described in "Photoshop Tip: Four Methods to Extract Images / Icons from Scanned Art." And Illustrator has a perspective drawing command and a variable stroke tool that gives illustrations some very interesting effects. 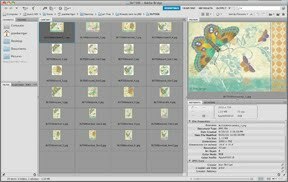 View the excellent videos listed below by Adobe software expert Terry White for demonstrations of these and many more commands to save time in extracting, altering, and creating images for patterns & backgrounds for art collections. • "Compositing and Selecting Hair in Photoshop CS5"
• "Adobe Photoshop CS5 - My Top 5 Favorite Features"
[cropping images, using healing brush with content aware, using puppet warp to change and bend position of images, getting rid of color and grainy noise in photos]. Note: HDR that is referred to in the video means high dynamic range photography. Hint: I used the puppet wrap tool to bend a straight candy cane into the star shape as shown at the top of this article. After bending the shape with puppet wrap, the result was not perfect (a little jagged in places) but it was easily cleaned up with the eraser and smug tools. The cane was shaded after it was bent and cleaned up. • "10 Random Photoshop CS5 Tips"
• "Adobe Illustrato CS5 - My top 5 Favorite Features"
• "Using the New Width Tool in Illustrator CS5"
The above videos demonstrate only a few of the new commands and tools in Photoshop CS5 and Illustrator CS5. 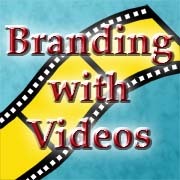 Videos demonstrating other new commands and tools in CS5 are available on Adobe.com, youtube.com, and Lynda.com. Many branding experts believe that it is just as important for customers to get to know the person behind the brand (i.e. artist) as it is to recognize the product (i.e. art). That is why photos of artists like Thomas Kinkade, Mary Engelbreit, Marjolein Bastin, and many others appear on marketing materials and sometimes on products such as greeting cards. An excellent way to market and thus brand not only the art but the artist is by creating videos and placing them onto the popular online video site youtube.com. Videos can be slide shows, a presentation of art, a demonstration by the artist, an interview of the artist, or a combination of all. For instance, view the video "The Magic of Flowers in Watercolour - With Janet Whittle" showcasing her as she paints, a slide show of the "Art of Donald Vann," and a painting demonstration on "Heavy Impasto Palette Knife Acrylic Painting Demo" by artist Gary Garrett. Creating videos is simple. Many digital cameras, laptop computers, and cell phones are capable of making videos so that purchasing a video camera is no longer necessary. And, easy to use software such a iMovie, that comes with the Apple operating system, can be used to edit and spiffy-up the video with background music, voice overs, and title pages. The videos listed in the previous paragraph have probably been enhanced in iMovie or similar software. Another way to gain brand recognition is to be interviewed by TV and e-show hosts as was metal sculpture artist Karen Rossi. View a series of 10 videos "Karen Rossi on Full Bloom Part 1" to see the entire broadcast. Or be showcased in presentations by manufacturers as was artist Paul Brent by "Tile Factory on Christmas in July Program with Paul Brent." Or even have art showcased on QVC as did artist Brenda Pinnick. Other examples of artists using videos to continually gain recognition of themselves and their art is a "Tour of Susan Winget's Art Studio" and "KETC / Living St. Louis / Mary Englebreit." Also, check out Tara Reeds "What's Your Art Licensing Story?" project, to see over 25 videos on how different artists started licensing their art and also to find out how to be included in the project. Editorial: Not only are videos an excellent way to brand an artist but also a way to leave lasting memories of them. View a TV segment video on "30 minutes Bay Area" of the artist "Laurel Burch Story" who suffered from degenerative brittle bone disease and died in 2007. Also view an interview of artist Cheri Blum (died in 2003) by retailer Pier 1 Imports. Both of these artists were extremely successful in licensing their work and still being licensed. Perhaps in the video "The Legacy of Laurel Burch" expresses best that an artist needs to have a drive to continually create, should live life to the fullest, and never give up. If you have any comments about this article, please write them in the below comment section. Art needs to be seen by manufacturers in order to get licensing contracts. The more frequently the art directors (ADs) of the manufactures see the artists work via marketing and publicity of all kinds, on products, and exhibiting at trade shows the better the chance it will be licensed. And one of the best methods in gaining visibility is to exhibit at trade shows that have an art licensing section. There is nothing that beats interacting personally with ADs to create interest in the art, find out what themes are needed, and how they wish to receive future submissions. Read "Art Licensing Trade Shows" for information about the different trade shows that have art licensing sections. Exhibiting at a show costs many thousand of dollars ($5,000 to over $10,000 depending on the show) for booth fee, hotel, airfare, booth display materials, and marketing materials. So before committing to exhibiting at a show, evaluate your art. Is it REALLY ready to be exhibited? Below are some questions that should be asked before exhibiting. The biggest complaint by computer users is that computers are not WYSIWYG (pronounced wizzy-wig; What You See Is What You Get). In other words, the color hues and shades on the monitor display does not always match the printed colors. In fact, it is impossible to absolutely match the colors because monitors and printed material are two different technologies. The backlit screen on the monitor make the colors brighter and lighter than the ink colors on dense paper. However, it is possible to get a fairly good match IF the monitor is properly calibrated and IF the color profile (generated by the calibration process) and print settings are entered correctly into the software being used to print the images. The reason why monitors need to be calibrated is that every monitor interprets information from the computer operating system (OS) differently. Thus the color on the monitor needs to be adjusted with a color profile. The color difference is very evident if two monitors are side-by-side and the same image is placed on both. But the colors seen on the monitor(s) will only be accurate if a profile made during the monitor(s) calibration is assigned to the Photoshop or Illustrator file. Note: The colors as perceived on monitors alters as ambient light changes during the day and the angle at which the monitor is viewed. Also colors in the monitors change as phosphors (CRT monitors) and liquid crystals (LCD monitors) fade over time. Thus, monitors should be regularly calibrated. Licensing Art: Don't be a legend in your own mind! Some artists are so afraid that their art will be stolen that they will not put it on a website or show it to manufacturers unless the manufacturer first signs a non-disclosure statement. Regrettably that really limits the success they might have in art licensing because art needs to be seen in order to get licensing deals. 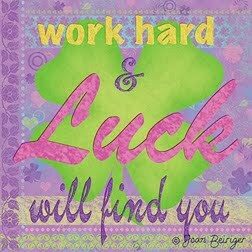 I agree with the mantra of Susan Miller, owner of Mixed Media Group* who states "Don't be a legend in your own mind." During the Licensing 101 seminar at Licensing International Expo 2007, Susan expressed her mantra and explained that no one will see your idea, concept or art if you don't show it. But you do need to protect it as best as you can, seek licensing partners (manufacturers) that are reputable, and prosecute persons knocking off your art if it makes economic sense. *Mixed Media Group, Inc. specializes in the development, production and licensing of intellectual properties such as ventriloquist Sherry Lewis, the animated series Wow! Wow! Wubbzy!, Mrs. Fields Cooky Corp., Marvel, Scholastic, Time, Inc. brands and artist Sandra Magsamen. Note: At the time this article was written Mixed Media Group website was "under construction" so it is not linked. Yes, you do take risks that your art will be lifted when you market your art by showing it to manufacturers, placing ads, distributing marketing material, showing it to the public on your website, and licensing it onto products. Unfortunately artists do get ripped off. And often they don't know it until perchance their family or friends spot the art and tell them or they see the art while browsing the internet. So it is a catch-22. Either do not show your art and fail to get deals OR show it and get deals but risk the possibility of having it stolen. • Do I have the right kind of art (style and themes) for products that consumers want? Network with successful artists and hire art licensing consultants that ARE willing to tell you the truth and give you constructive criticism. Read "Networking Resource - Art Licensing Forums," and "On Art Licensing Coaches (consultants)." • Do I have enough art to interest manufacturers? The more art you have the better chance manufacturers will license some of your art. • Am I approaching the right manufacturers for my art style and themes? Don't approach manufacturers that don't use your art style and themes on their products. For instance, it is a waste of time contacting manufacturers that only uses realistic old fashioned themed art on their products which isn't your style. • Am I following-up after contacting manufacturers? Read "Art Licensing Tip: What does follow-up really mean?" * I love to hear accolades about my art. But it is more useful when I receive constructive criticism such as "the art is too busy. You should . . .", "the colors are too dark", "the images doesn't pop", "the text in the art doesn't standout, and "I can't use that theme on my products." Art licensing is about building relationships in the licensing industry. Networking and sharing your knowledge about the industry with artists, licensing experts, and manufacturers helps create those relationships. If you share information, others will also share information so that it is a win-win situation. I know it has worked for me and it is the reason why I share licensing information on my blog. For example, an art director spent a half-hour going through my portfolio at the Atlanta Gift Show and then proceeded to tell me WHY my art does NOT fit the needs of his company. Some artists may think this is rejection but to me it was HUGE! He gave me invaluable information that helped me improve my art and make it more licensable. On top of that I then knew why I wasn't getting anywhere in licensing my art to his company. When I queried him on why he spent so much time looking through my art and then telling me why it wouldn't work for him, he said "you have helped so many artists (through my blog) that you deserve my help." Wow, I was "blown away" and very thankful for his input! Artist Khristian Howell benefited by other artists sharing information with her when she exhibited at the Surtex show. Read "Tips from a First Time Surtex Exhibitor" on how Khristian found that by having a positive mental attitude and networking with other artists made exhibiting at Surtex a positive experience. Do you think that she will now share information with others? You bet she will! Thinking positivity is difficult when manufacturers continue to reject your art. But rejection is part of the art licensing business and you need to continually deal with it. 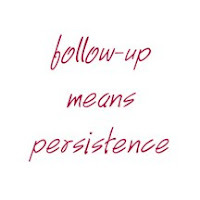 You must be persistent and not give up if you hope to license your art. Read "The Illustion of Rejection and How to Deal with It" by agent Maria Brophy. Also read "Dealing with Rejection: Tips for Card Designers" a five part series of articles by artist Kate Harper. The last several years with the poor economy has reduced licensing opportunities for many artists. But that hasn't stop agent Lilla Rogers. Read her article "My Thoughts on Being an Artist in a Recession" for tips on improving the chances in licensing your art. 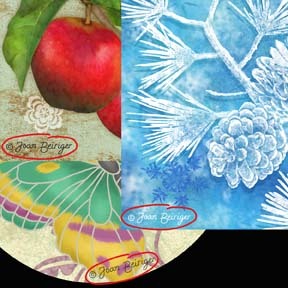 And obviously artist and product designer Carol Eldridge hasn't let the poor economy stop her from licensing her art. Read "Licensed Samples and Such...." to see her recent licensing success which shows "that perseverance does pay off!" So read the articles listed in this blog for information on how artists and agents continue to be positive in a challenging art licensing industry. And become a PAL to increase your licensing opportunities! Comments are welcomed. Please click on "comments" and then write them in the comment window at the bottom of this article. Licensing Art - There is no such thing as a typical deal. Every licensing contract is unique. There is NO typical deal (contract, agreement) in art licensing because it depends upon the manufacturer, industry, products, the notoriety of the artist, etc. which affects the terms and payment. Also negotiations between the property owner (or representative) and licensee (manufacturer) affects the contract. *SKU (pronounced skew) means a stock-keeping unit and is used by retailers to keep track of individual items for inventory. If you do not want to spend the money to hire an attorney to look over a contract, think again. Contracts can be complicated. Ideally the contract should benefit both licensor and licensee. But missing terms, placement and incorrect use of words, rights given to the licensor at the beginning of the contract but later taken away with confusing terminology can make a big difference in the contract and ultimately benefit the licensee and not the licensor. Don't be foolish and risk losing revenue or even your art by failing to hire a reputable art licensing IP attorney. Read "Hire a Lawyer - but Which One?" for information on hiring lawyers that specialize in art licensing. Below are comments about some of the terms in a contract. Also read "The legalities of Licensing" by attorney Joshua Kaufman for information and definitions of terms. Note: This article was written in 2004 and amounts stated for royalties etc. are no longer accurate. • Advance: A non-refundable advance payment against royalties to the licensor is sometimes given when a contract is signed. It shows that the licensee has faith that licensors art on their products will sell. In the past, advances were often given but recently there are much fewer. Advances can range from a low $100 per image to $30,000 or more for multiple images and/or SKUs in a product line. 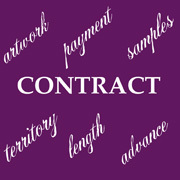 • Artwork: Contracts should list the art that is being licensed. The contract should not state or infer that all the licensors artwork is being llicensed. • Exclusivity: Some licensees want to have an exclusive arrangement with the licensor. That way the licensor does not license their unique work to the licensees competition. Usually this is when the licensee wants to introduce a large line of art by the licensor. An exclusive arrangement could be beneficial to the licensor if the licensee markets the art, has a large customer base, and continues to license more art. It is not beneficial to the licensor if the licensee only wants to license a few designs because then other licensing opportunities are lost. • Guarantee: Guarantees on the monies to be earned during the length of the contract are now rarely offered to artists unless they are a well known brand with a proven track record in being able to sell products with their art. • Length: The length of the licensing agreement depends upon the type of product, how long it takes to manufacturer and get to market, and how long the manufacturer anticipates that it will be sold. Most contracts last two to three years. • Payment: There are three basic types of payment agreements in the licensing industry (on-demand, flat-fee and royalty). Licensors and licensees agree that each have their place in licensing art. They are discussed below. • Samples & Sample Approval: Samples of the product are not always offered to the licensor especially if the product is produced only when ordered by the client. Sample approval by the licensor before the products are mass produced and sold to retailers is not always given. In fact, licensor sample approval is not possible for many licensees because of tight scheduling in producing the products and shipping to retailers. • Territory: The territory of the contract is usually United States or North America with additional countries listed separately. Listing world-wide as the territory is unwise if the licensee does not sell their products world-wide because it limits the potential of licensing the art to other countries. This type of payment means that the licensee does not manufacturer the product until it is ordered by a client. Thus the licensor may not receive a fee if no product is ordered. It allows the licensee to secure the use of art without investing in it. A quarterly royalty rate is the fee normally given for this type of payment. The pros for the licensor is the art gets visibility which MAY result in sales. The cons for the licensor is that the art is not available for licensing of the same product (unless it is non-exclusive) during the time of the contract with no guarantee that the product will ever be manufactured and sold. It is up to the licensor to determine if the visibility and the hope that the licensee's clients purchase the products out weights the cons. Unfortunately this type of payment is becoming more common. A licensing flat-fee (usually just called flat fee) gives the artist all the benefits in a licensing agreement but instead of getting royalties the artist gets a one time upfront fee that MAY range from $500 to $2000 per SKU. A licensing flat-fee is usually offered by a licensee that does not want to be bothered by tracking sales of licensed art on products or does not have an established bookkeeping system to manage royalties. The cons to this type of payment is that the artist may lose revenue if the product is popular and has multiple printings. The pros is that the payment is made up front instead over a period of years or not at all if the product is not made or does not sell. Some licensors recommend taking this kind of deal if the licensee does not have a large customer base or if the theme of the art is a fad and retailers may not order and reorder enough products. Note: When you hear the term "flat fee" in the licensing industry do not confuse it with the term "flat fee" used by some illustrators and artists. Flat-fees in that case means selling all rights to their work including the copyright. In art licensing, flat fee means a one time payment in a licensing agreement. Receiving royalties is usually the choice of payment for most licensors because the most revenue may potentially be made with this type of payment method. But the licensor takes a chance that the product(s) will sell well. If they do not sell well, the licensor may not make any revenue or very little. I have heard that one artist only made $25 for one image during the two year length of the contract. Another artist made "many" thousands of dollars in the same time period. Every licensee offers different royalties depending on the type of products they sell and are paid quarterly. The average art licensing royalty is in the 4-6 percent range but can be larger depending on the product and how well known the licensor. Royalty rates can be found in the following publications. "Graphic Artist's Guide Handbook of Pricing and Ethical Guidelines" (published September 29, 2010 - cost $26.39) This publication can be read at some public libraries or purchased. It includes the pricing for many kinds of art and illustrations and includes royalty rates for "some" art licensing industries. "The Licensing Letter Royalty Trends Report" (2010 edition - cost $319.00) This is a comprehensive report on royalties for the entire licensing industry including art licensing. Note: I have not purchase this report so I do not know how much information it has on the art licensing industry. When deciding on whether to sign a contract or not, do not just judge it only on the offered percent of the royalties but on all the terms. Also find out how large the licensee customer base, licensee estimate on number of products sold, and if an advance is offered. At first glance a six-to-eight percent royalty may sound better than a four percent royalty. However, a four percent royalty deal for products selling to big box retailers with a huge number of stores could yield ten times the revenue that a six-to-eight percent royalty deal for products sold to a modest amount of gift stores. The actual calculation on how royalties are paid differ from licensee to licensee and the terminology in the contracts can be very confusing. Royalties are not often based on the wholesale price of the product but on the net price that can include discounts, shipping etc. That is another reason why an attorney should review contracts before they are signed by the licensor. Read "Royalties Rates: Not as simple As you may think!" by attorney Joshua Kaufman to find out more. Note: This article was written in 2002 and amounts stated for royalty rates are no longer accurate. I believe that knowledge is power. Learn as much as you can about licensing contracts. Become familiar with what should be included in them and read the articles linked to this post so that you are aware of the pitfalls before signing a contract. And always be willing to negotiate a contract that is not beneficial to you. Comments are welcomed. Please click on comments and write them in the comment window at the bottom of this article. Keeping track of art, copyright information, and licensing contracts can be difficult at the beginning of an artist's licensing career. And nearly impossible with even moderate licensing success as the number of art collections and contracts increase. Not properly keeping track of art and contracts can result in assigning the same art identification number to multiple collections, losing track on whether copyrights have been filed and forms received, missed opportunities in negotiating new terms for renewable contracts, and not knowing if collections are available for licensing in a particular category. Some artists try to keep track of contracts and pertinent information by manually filing them with printed pictures of the individual collections. Others use software such as Microsoft Excel (spreadsheet), simple database software such as Bento, or more complicated relational database software such as FileMaker Pro. However, the problem with any software package is that you need to learn how to use the software to build the tables and relationships (if applicable) for tracking which can take time. And some of the software is complicated and not very intuitive to learn such as FileMaker Pro. Note: There is an online service that is dedicated to tracking licensing information. Unfortunately, most artists cannot afford it because it costs thousands of dollars. But just released is a new affordable software package called Art Licensing Management. It is turnkey (ready for immediate use) database constructed with FileMaker Pro that was designed by artist Tara Reed in collaboration with CampSoftware. See below for more information. Spreadsheet software is okay for listing data but is cumbersome in retrieving data and updating tables after adding data. Databases like Bento (Mac only) works well because it uses pre-designed templates and forms so that the user can organize contacts and track projects. Bento is somewhat limited for use in art licensing because it does not have a fully customizable interface (limited in constructing forms, tables etc.) and does not automatically link related data. But some artists find that Bento fit their needs and is well worth the cost of $49. FileMaker Pro costs $300 and has all the bells and whistles that you can think of. The user can create any kind of customized forms/tables, graph data, and link data to multiple files. I use FileMaker Pro to track my art, copyrights and licensing contracts. But its ability to do so many things makes the learning curve very steep. The instructions are not always clear so that I was often frustrated as I spent MANY hours in building tables and trying to figure out how to link the data by setting up relationships. It was not a fun experience but at least I can now effortlessly track the information I need. 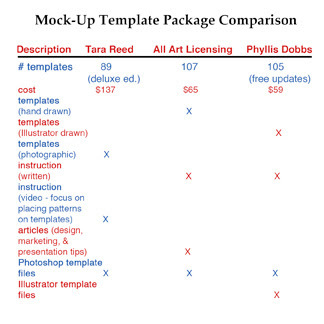 Artist Tara Reed and CampSoftware's "Art Licensing Management" software costs $250 which I feel is a bargain (unsolicited and uncompensated recommendation). It is turnkey which means that all you need to do is enter data. The different tracking lists (collections, licensee, etc.) are created automatically. Because the database was created by an artist that licenses art (Tara), it tracks that right kind of data that is needed to keep artists organized. For instance, it tracks art collections with associated code numbers, copyright information, backup information, manufacturers, contact details, licensing deals including products and royalties. The only drawback in using this software is that additional data lists cannot be created by the user and CampSoftware needs to be hired to create them. However, additional lists are probably not needed because the basic lists are included in the software. Check out Art Licensing Management info page for more information, examples of data tables, and a demo video. Note: I have not used Art Licensing Management database but Tara always produces quality products. Hint: Even if you do not yet have any licensing deals or very few, this software is an excellent way to track your art collections and copyrights. Tracking art and licensing information can be one of those boring jobs that no artist likes to do. But it is very important to keep track so that the same image is not licensed to more than one manufacturer, contracts are renewed (or not) on time, copyrights are received in a timely manner, etc. So whatever way you choose to track your art and contracts (manual filing system, spreadsheets, or database) make sure that it gets done. In art licensing, normally a computer with Adobe Photoshop software is used to manipulate art into various formats, crop the art, isolate icons from central images to use in patterns, and add other design elements to convert it for products shapes. Manufacturers wishing to license the art expect to receive digital images not original paintings. They usually request high resolution (300dpi) jpg format or layered Photoshop or Illustrator files. Art that is created with paint instead of digitally need to be converted into digital images by either photographing or by scanning them with a flat bed scanner. Unfortunately there are drawbacks with both methods. 1. the camera has a high enough resolution to capture fine detail. That means that if a digital camera is used it should have at least five megapixels and preferably over 10 megapixels resolution. 2. digital camera photographs should be saved as RAW image files to preserve accurate color and obtain the maximum pixel data. Later the files can be converted while in Photoshop to device-dependent colorspaces for viewing and printing. Note: RAW image files, sometimes called digital negatives contains all the information needed to produce images but has not been sufficiently processed to do so. 3. natural subdued and even lightening is used to give accurate colors and to avoid any glare off the surface of the painting. 4. the camera lens in relationship to the surface of the painting must be absolutely parallel. Otherwise, a parallax distortion will occur and the shape of the painting will be skewed. Getting good lightening and evading parallax while photographing paintings takes experimentation and practice. That is why some fine art artists have their paintings professionally photographed instead of doing it themselves. 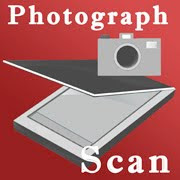 Modern scanners can scan at a resolution comparable to high resolution digital cameras. And the problem of having parallax distortion is avoided because the art is placed on the scanner platen which is parallel to the lens of the scanner. But there are still problems to solve when scanning large paintings that do not fit the platen and/or have a high sheen or complex designs that cause moiré patterns. 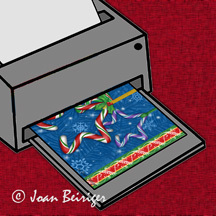 Most artists that license their work use scanners to convert their paintings into digital images because they are easy to use and normally do a good job. Some artists find that scanning at 300dpi resolution is sufficient while others scan at 600dpi to make sure that their art does not lose resolution when they are enlarged for large products like decorative flags. Photoshop is used to correct any deficiencies that occur from the scanning process such as correcting colors and moiré patterns, and blending several images together when the painting is too large to scan in one pass. Read "Photoshop Tip: Quick Method to Color Correct Scanned Art and Photographs" and "Photoshop Tip: Tweaking Scanned Art" for suggestions on how to color correct, extract design elements, merge scanned images and remove moiré patterns. To avoid having to piece images together in Photoshop, some artists paint art that is small enough to fit their scanner platen so that it can be scanned in one pass. Some create backgounds, icons, and design elements separately that is then scanned and arranged in Photoshop. Other artists scan the paintings that fit on their scanners and take photographs of their larger paintings. But whatever way you decide to convert your paintings into digital pictures, make sure that they end up with good color and high resolution. Sure you can make a living licensing your art but there are caveats in being able to do so. Artists that are successful have discovered the right mixture in creating art that consumers love, getting licensing contracts with manufacturers that successfully sell products with the art, and being lucky. These artists work hard, continually evolve their art, and never give up when the going gets tough. To find out more about the benefits in working hard and evolving art, read "Licensing Art is Hard Work," and "How to Keep Art Fresh & New: Continually Evolve Your Work - part 1." It usually takes years to get enough strong licensing contracts to generate a constant revenue stream. The overnight success of artists making it big are few and far between. Although it can happen, such as artist Cheri Blum found out in the early 2000s. In four years she went from zero licensing deals to having her art licensed on over $100 million dollars of products at retail to the amazement of licensing experts. 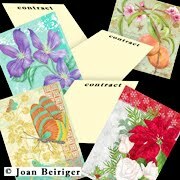 Her uniquely textured floral art that emotes nostalgia of bygone times, having a huge body of work with a popular theme (flowers), having the right art at a time that consumers were looking for art reminiscent of the past, and being represented by a licensing agency with a strong marketing program contributed to her success. However, it has taken other well known artists 10, 15, or 20 years to generate the same amount of success. To see money earned (retail sales of products with licensed art) of the top art licensors, read "Tracking the Success of Top Licensors." Study the included table and see how the retail sales has increased, stabilized in some cases, and then decreased. That is the typical life cycle of business' and definitely applies to licensing art. Even though you and I would love to make the money that these extremely successful artists do, we may never achieve that dream. However, it is possible to make a living in art licensing if you create unique licensable art that emits an emotional response with consumers, partner with manufacturers that are successful in selling lots of products with your art, work hard, and most of all do not give up. You may start by only making a couple of hundred dollars a year but by working hard, having patience, and keep plugging away you should eventually increase the income and finally make a living by licensing your art. But is it a sure thing? Unfortunately the answer is no because there are just too many variables. But there are artists making a living at licensing their art such as artist Drew Brophy with his unique surf art. Maria, his wife and agent shared in her blog article "Art Licensing 101 Lecture RECAP" that they earn a good living from licensing Drew's art but it took " . . . quite a few years to make it happen, though. Ten years ago we earned all of $5,000 in one year of licensing. So far in the first 6 months of 2010, we've earned about $150,000." Now that is inspiring! Hint: Make sure that you read Maria Brophy's blog articles. She shares great information. Too often I get emails from artists hoping to license their art and they have the misconception that they can use their existing work, automatically get licensing contracts, sit back and watch the money pour in. Licensing art is NOT easy. Artists that are successful in licensing have to work very hard to continually create new art that is licensable, create collections around their central images, format and edit their art to manufactures specifications, and market their art to some degree if they have an agent and a lot if they do not have an agent. On top of that art licensing involves lots of research in learning how to license art, what kind of art manufacturers want, what art themes and colors are currently popular, and the list goes on. The ultimate goal of manufacturers is to sell products. Manufacturers are willing to license art to enhance their products so that consumers will purchase them. Thus, artists need to work hard at understanding what kind of art will entice consumers and realize that not all art sells products. 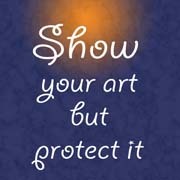 Artists new to licensing often create art first and then search for products to put the art on. This method is not always successful. Instead the artist should think about the product first and create art for the product. For another perceptive on creating art for products, read art agent Jim Marcotte of Two Town Studios article "What is it?" Hint: Check out all of Jim's blog articles. His quirky and amusing comments are full of interesting and helpful information about the art licensing industry. All the hard work can pay off though; not only financially but having the satisfaction in seeing your art on products. 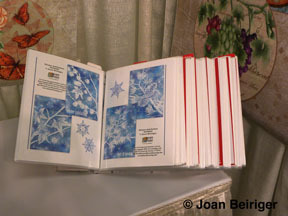 Read the following blog articles of artists that attended the summer 2010 Atlanta Show and see how pleased they were when they saw their wonderful art on products in the AtlantaMart showrooms. Terri Conrad - "A new Cottage Chic day by Terri Conrad Designs® for Creative Co-Op"
Phyllis Dobbs - "Hot'lanta - trip to the Atlanta Gift Market"
Carol Eldridge - "Atlanta Follow Up"
BJ Lantz - "Atlanta Gift Show * July 2010"
Jane Mayday - "Atlanta Gift Show"
Joyce Shelton - "Atlanta Market"
Sue Zipkin - "Adventures in Atlanta"
The above artists have worked very hard for years in order to successfully license their art. Now that they have finally made it, do you think they are going to rest on their laurels? Nope! They know better and most likely they will work harder than ever. But as artist Andy Mathis points out in his comment to this article, if you are passionate about your art it is NOT a chore! Comments are welcomed. Please click on the below comment button and enter your comment in the Post Comment section. Often I hear that if a person frequently uses the same commands in Photoshop it is a lot faster to use the keystroke shortcuts. Those shortcuts are found next to each command on the pull down menus. For example, if you hold down the selection icon (marque) in the tool bar you will see that the letter M next to the Rectangular Marquee Tool and next to the Elliptical Margue Tool but no letter next to the Single Row Marque Tool or Single Column Marque tool. The Single Row and Single Column do not have keystroke shortcuts assigned to them. Thus, if you press the letter m either the rectangular or the elliptical margue tool will be selected depending on which one was last used. Hint: If the shift key and letter m key is held down you can toggle back and forth between the rectangular and elliptical marque tools. And you can toggle from the Dodge Tool, to the Burn Tool, to the Sponge Tool by holding down the shift key and pressing the letter o key. When I first started using Photoshop it seemed too much trouble to memorize the commands. So I continued doing it the old-fashioned way by using the pull down menus to select a tool or command until I finally got tired of interrupting my work flow by continually moving my mouse and using a pull down menu. And what I heard is right. IT IS A LOT FASTER TO USE KEYBOARD COMMANDS. So now I press the command plus the letter s to save the file, the letter l to select the lasso tool, the letter w to select the magic wand tool, the letter b to select the brush tool, use the ] key to increase a brush size and [ to decrease the size, etc. And to remind me what keystrokes to use for the tools and commands, I have a cheat sheet of the shortcuts next to my computer. Unfortunately not all the tools and commands have keyboard shortcuts BUT you can customize the keyboard in Photoshop to assign them. The Tools menu uses the letters A to Z and all the letters have already been assigned default settings. However, shortcuts for commands that you rarely use can be reassigned to ones that you wish to use. To look at and edit keyboard shortcuts on the Mac, hold down the option (alt key on the PC) key plus the shift key plus the command key plus press the letter k key OR go to the Edit menu and select Keyboard Shortcuts at the bottom of the menu. To see the different command menus,' select Application Menu, or Panel Menus, or Tools in "Shortcuts For" pulldown. For instance, if you select Tools a list of the Tool Panel Commands with the associated shortcuts will appear. So far, the only shortcut commands that I have needed to customize are the tools. Below are a few examples of why and how I customized the keyboard shortcuts to fit my needs. Your needs will be different than mine so you will customize the tool and command pallets differently. 1. Dodge / Burn / Sponge Tools - The default keystroke for these tools is the letter o for each of them. You can then use the shift key plus the letter o to toggle between them. However, I rarely use the sponge tool. Thus, I removed the O from the Sponge Tool in the shortcut menu so that now I can toggle just between the Dodge and Burn Tools. 2. Blur / Sharpen / Smudge Tools - The default does not have a shortcut for these tools. I often use the Smudge Tool and rarely toggle between screen modes so I removed the F key shortcut from Toggle Screen Modes and reassigned it to the Smudge Tool. Note: If I wished, I could have also put the F letter for the Blur and Sharpen Tools and then could have toggled between the blur, sharpen, and smudge tools by holding down the shift key and pressing the letter f.
Any suggests or comments that you would like to share about this article would be greatly appreciated. Click on the comment section below.